Liss and I had our quarterly shopping day and man, did we ever have fun! I was hugely successful at anthropologie and H&M. 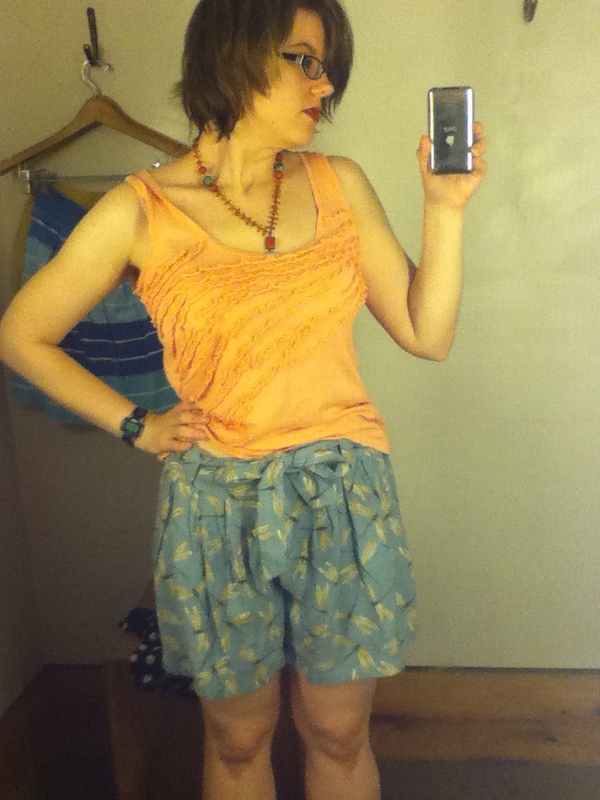 But the best part was probably trying things on at anthro. 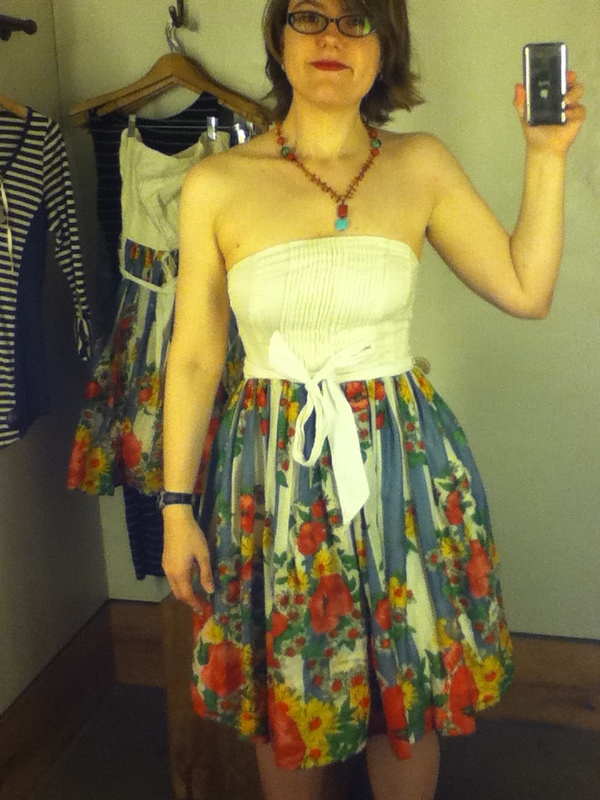 This was actually what I went in wanting to try on – I saw it in NYC and fell in love. The material is so soft and drapy and the color perfectly vibrant. But when it was on…I wasn’t in love. Not $68 worth, anyway. The small had a better drape on me than the medium, so wishlisted for sale time. I saw this in the window and made a bee line for it. They jumped from size 2 to 8, so this is a little big, but the real problem is that the material is quite stiff. It looks fine when I’m still, but major pooching when I walk or sit – it just bends out like a triangle at my tummy. No good. Maybe this wouldn’t be such an issue if I was wearing the right size, but gorgeous pattern and perfect neckline or not, this just wasn’t it. I was really curious about the dropwaist silhouette, but I think we can agree that it is not for me. It felt super 80s ice skater, and the fact that there’s a huge long cut out in the back that displays my bra prominently really cemented that this dress was Not For Me. Like I said, curious about the drop waist! But this was a definite no go. The size 6 zipped over my waist perfectly, but couldn’t go over my chest. 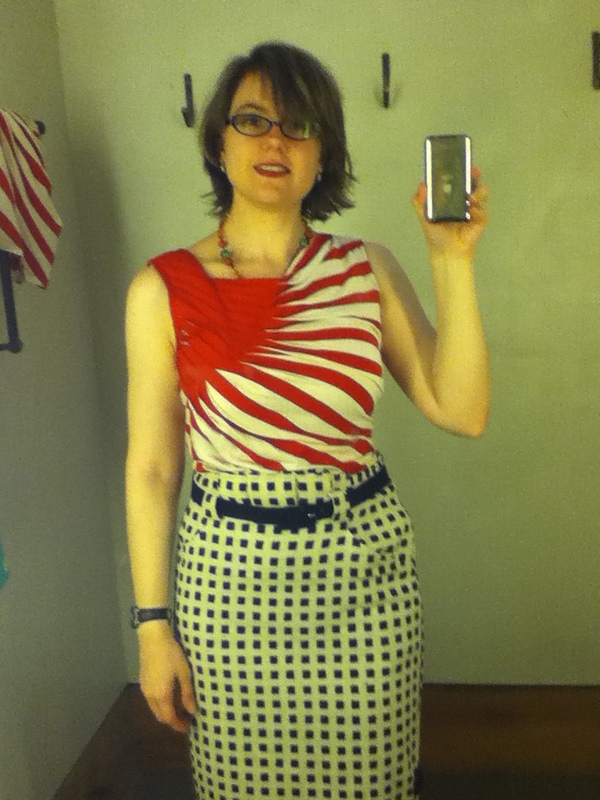 Also, the heavier fabric really did weird puffy things over my hips, too. Pass. I like things that are cute, but this was a little too sweet for me. I couldn’t resist trying it on, though, and I actually do like it. This is a fun summer dress, runs true to size and I might consider it if it goes to sale. The website says this is red, but no way. It’s not even orangey-red. But the moment I put it on, I was in love. It is perfectly me and I think it’ll be fun to wear with jeans or a pencil skirt. It runs a little large – this is a size small and it’s perfect. There’s a lot of purple in this brown, so it’s going to go with a lot of things. Size down – this small had great drape. 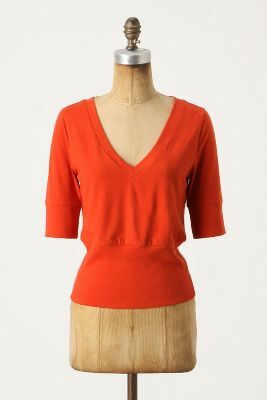 I love how it can be worn open, belted into a wrap, or buttoned into a fun swoosh. I see now that some of the reviews say it snags easily, so I’ll have to keep my eye on that. But I’ve been wanting a cardigan exactly like this and I’m thrilled with this one! Operation: Distract Shelley took place on Friday in the following locations: anthropologie, Magnolia Cupcakes, Argo Tea and Lush, with brief forays into The Disney Store, Zara and Macy’s. Some winners, some losers, some maybe laters. Let’s explore. This is a medium, so it’s TTS, but it did the oddest things to my chest. Maybe I should have tried a solid color, but this was a no go. I love the diagonal stripes, but that line across is just wrong. I didn’t actually pull this one, it was just waiting in my dressing room. I actually loved this a lot, but it’s not work appropriate and I don’t go on enough dates to spend $88 on it. Maybe for sale time, if it drops low enough. I adore the neckline, and the medium fits well. I now notice that there is an online exclusive dress, Tsubaki, which looks quite similar with a perfect pattern. Hmm. Well worth considering for a wishlist. I wanted to love this, especially for $20. But this was a small and it was SO BIG. Sad. 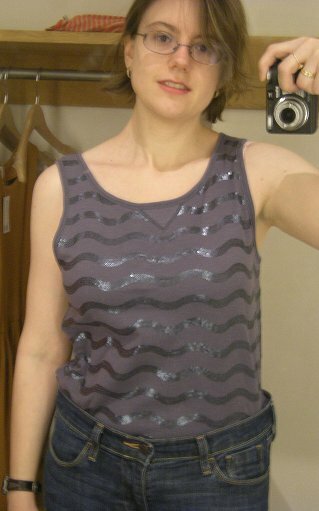 But I need a sparkly tank top at some point. I’ve been trying and trying to find an orange shirt for months, so I had to grab this. This is a medium, so it runs true to size. I love the ruching and the flowers. Short sleeves are hard to manage in fall/winter – they get hidden by cardigans, which is a shame. I dithered on this one for awhile, because I think it makes me look more pear-shaped than I prefer, but it ultimately won me over. I have a lot of style options for it, including tucked in ones that could eliminate the pear issue, and it’s something that has been missing from my wardrobe. Sold, for $58. Except now I’m having second thoughts again. Is this a keeper or a returner, friends? My mother said this was drab, and looking back, I can see that. It’s alpaca, so it’s soft and not scratchy, but does obviously require a camisole under it (hi, tummy). Love the boatneck and lace, but however cuddly it is, it lacks a wow factor. Also, I feel I own something similar. Or maybe I’m just thinking of the dozen purple sweaters in my winter wardrobe. I need to break that rut. 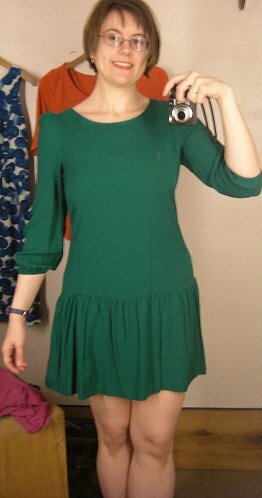 I’ve seen this online and in person for months, and never tried it on – it looked like a 1960s Catholic school girl dress. 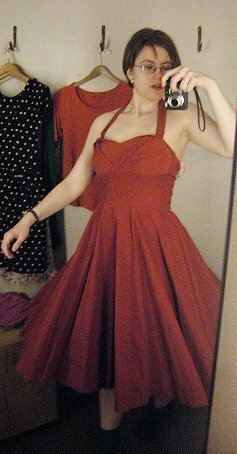 And then I tried it on and fell in love. Mad love. A love to spend $158 on. 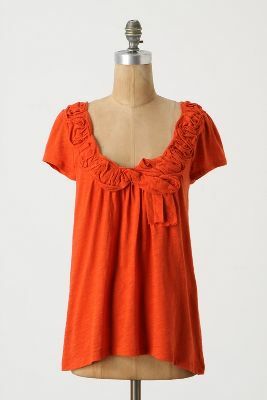 This is a medium and while there’s a bit of extra room, that will be perfect for layering. I asked three salesladies – how do I style this color? I got back some great answers that I’m excited to try. Maybe even tomorrow! I adore the silhouette and fit and the fabric is delightfully stretchy and comfortable. The wine color is probably more Me, but I am surprisingly drawn to this gold. I am going to wear the hell out of this dress this winter, and have fun doing it. 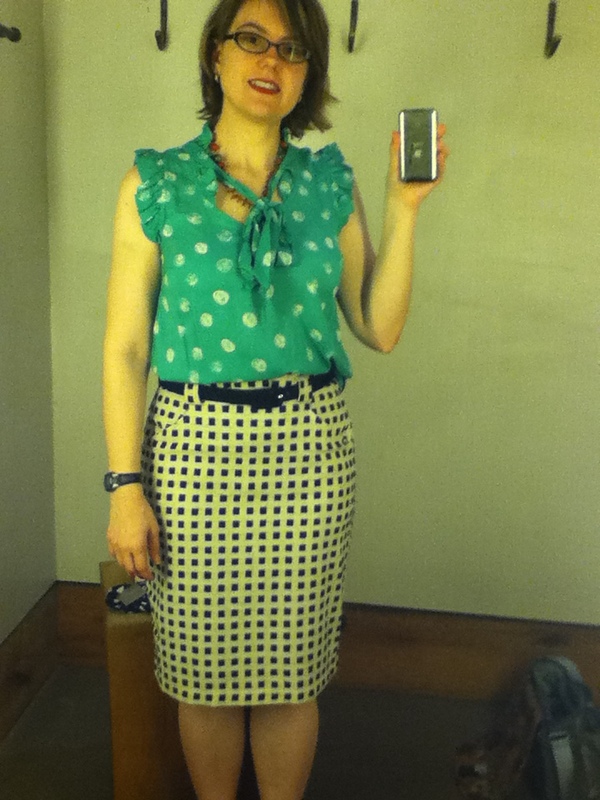 Part two, dresses, bottoms and the shirt I actually went there to try on, to come later. 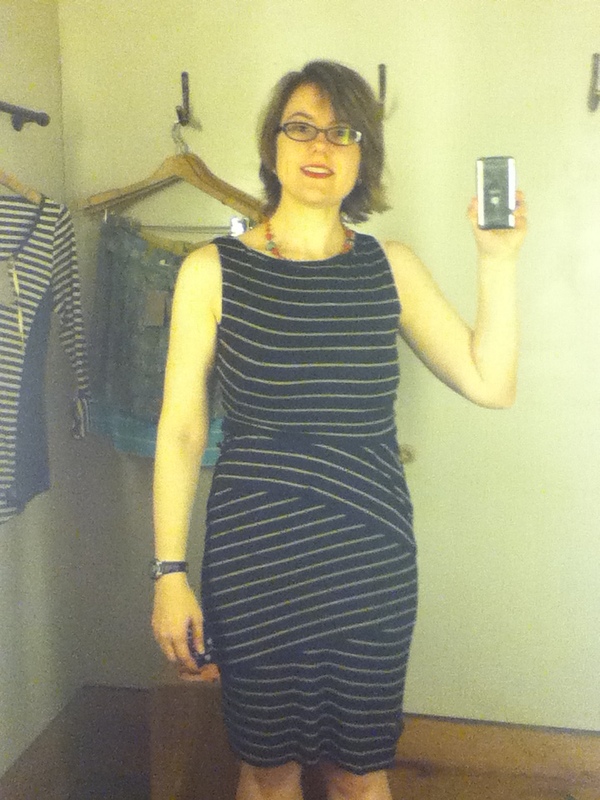 I had an unexpected opportunity to hit Anthro yesterday – yay!! I didn’t have my iTouch with me so I thought I couldn’t take pictures – boo!! I had my damned camera in my purse – idiot!! So let’s see how well I can do this by description alone. I saw the Winner’s Circle in orange, and thought it looked great for fall. 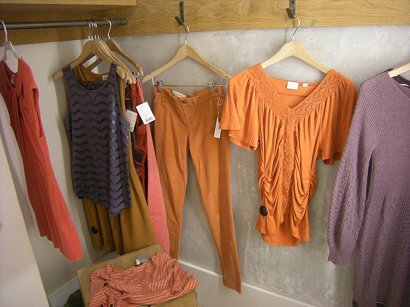 It’s a rust orange that would transition perfectly with the right cardigans. I grabbed a medium and it was huge. This would require me sizing down to at least an xsmall, I think. Medium was the smallest size they had, so I wasn’t able to test it. It’s a cute top, but the rosettes are flat and unkempt, even in the catalog photos. Even if I’d found the xsmall, and it fit perfectly, I don’t think I would have taken it. I loved the color of the Soft Bands, and I thought this would play up my waist pretty well. I took a medium, and that was about right, but it didn’t look very good on me. The banding started just below my waist and the fitted part just emphasized my tummy. 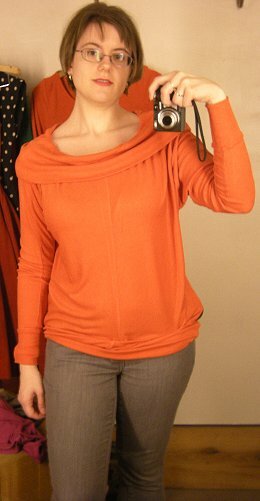 It was also too short on me – I don’t wear many high waisted bottoms, which this sweater requires. The third item I tried on was a print dress that I can’t find on the website. I’ll keep checking back. I thought it was a shirt dress, so I grabbed a 10 for it to cover my chest, and that was too big. But that was the least of the problems – it was kind of a shirtdress, but no need to worry about it buttoning over my chest because there were no buttons that high up. 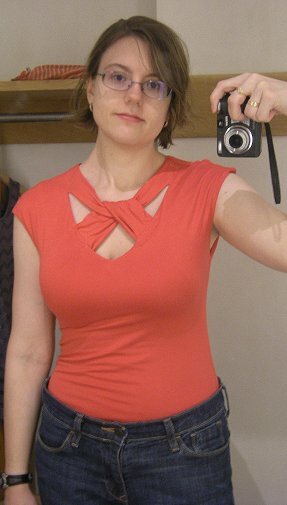 The top was a drapy wrap style, showing off a fair amount of cleavage if I moved the wrong way. Then came a series of buttons to about the tops of my thighs, and then it was just an open asymmetrical wrap. I had a few moments of wondering if I was wearing it right, which is never a good sign. I loved the print, but it was just too open up high and down low. eta: Looking at the reviews now on the site, I’m guessing my issues came from it being too big, since 10s don’t fit me normally and this apparently runs big. But still not going to try on a proper size, it just wasn’t me. Love! So much love. Settee Roses didn’t catch my eye at all online, and I don’t usually like floral prints, but it just called to me. I grabbed a 10 originally and it was too big. Why can’t I get it through my head that I am not a size 10 anymore? I asked them to get me a 6 and it was perfect. It’s a heavy linen, lined, with pockets, that will easily take me all through the autumn. It’s a gorgeous tea length, swingy and fun and if it wasn’t clear from my glowing words, it came home with me. 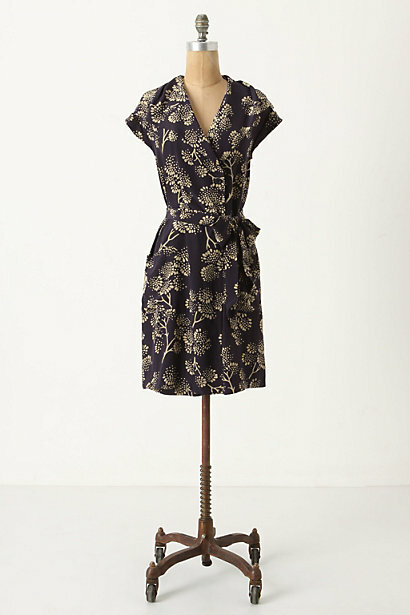 It’s so reasonably priced for Anthro and it’s so very me. It’ll look great with my blue top, or my white or brown cardigans and I can’t wait to wear it this September!! Of course, things caught my eye that didn’t come with me into the dressing room. I’m not going to lie, I totally fell in love with the Fatigue Finery Cape, but I know there’s no place in my life for it. And I own a forest green knit cape, anyway. The Eastward Dress Coat was even more impractical, but adorable. 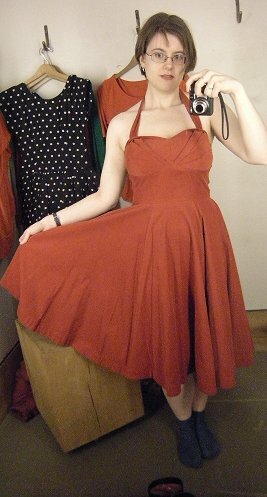 My beloved Mompos Dress went on sale last week, and I was so disappointed to see that it entirely sold out online that same morning. Unsurprisingly, it wasn’t in the sale room anymore, either. And the one on eBay is more expensive than the store! Maybe in time, the resale price will drop and it can be mine. 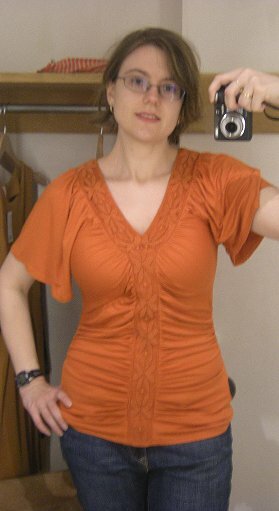 I walked by the Okra Corset Top on a table a few times because I loved the color of the belt, but the way they had it folded, I had no idea what it was! And with a hand full of hangers, I didn’t have a chance to find out. Which is a bummer, because it’s cute and I’d have liked to try it on. I’ll have to make another trip out next month when more fall stuff is out! Anthropologie Not Quite Rights. Most of these involve dresses for someone with a different life. But that’s what dressing rooms are for, right?? Flower Stand Dress. I knew I would never buy this, but it was SO CUTE. I grabbed an 8 and Liss just shook her head at me and grabbed the 4. I tried on the 4, and, well, hell. Two stores in a row! It’s freaking adorable, but the top is a little short, I have no place to wear it and it’s too expensive. But I love that it fit. And I love that skirt. The top is flattering in some ways and not in others. 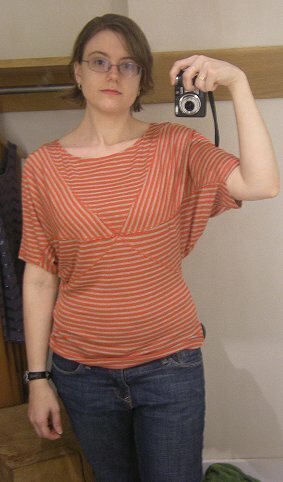 I like the crazy stripes and the medium is an okay fit, but something was just off about it. I’ve talked about my love for this skirt before. I adore it madly, and hope that it comes down from its current $148, which I cannot pay. 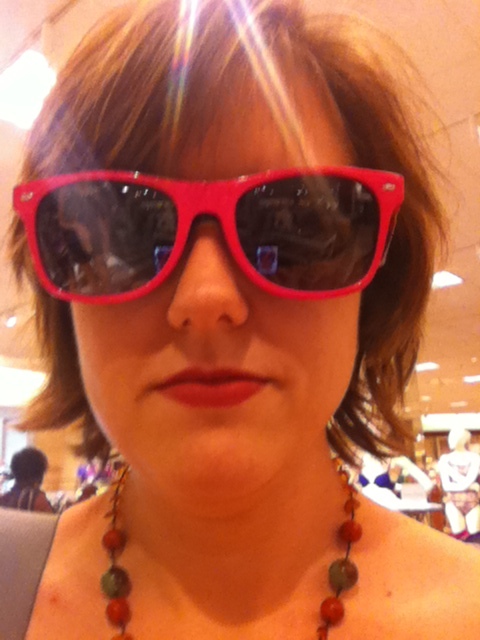 Icon Eyewear Maureen sunglasses in hot pink. Heh. Just for fun. 1 – 2 – 3 – CHARGE IT! I had a massively successful shopping trip with my friend Melissa today! We had such a fun time going in and out of stores – H&M, Ann Taylor Loft, Anthropologie, JCrew, and Forever 21. I tried on a ton of stuff and ended up just a tiny bit over my budget. 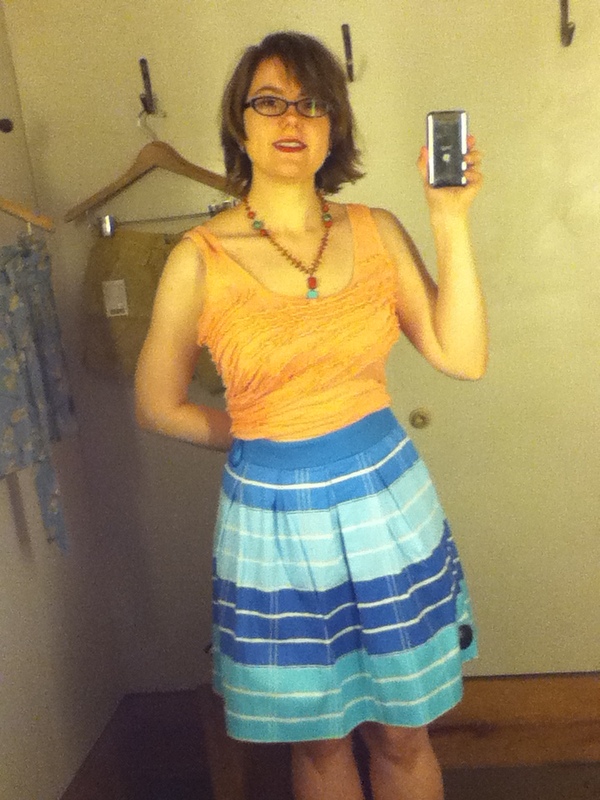 The backstory on this one is that I found this adorable waterpaint style skirt and grabbed a size 10. I loved it, but it was big – it sat low on my hips. Liss went to grab me the 8, which, had I thought about it, I would have grabbed first anyway. Still cute, still big. She pointed out that it wasn’t just a little big, it was a lot big. She told me to stay put and went to grab me a skirt in a different style and told me to try it on. I did. 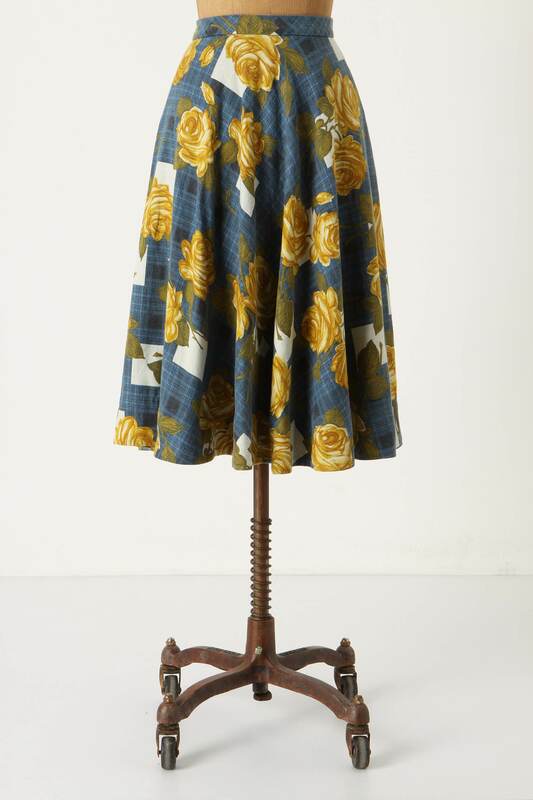 This skirt. It’s casual, clearly not work, but will be fun to kick around in on the weekend. Maybe even walk/dance in. Odanata Coulottes! I tried these on in May but they were too big and too expensive. Now they are half off, and the size 6 fit great.I love how they swing and hang, and a size 8 might be even cuter with more swinging and hanging, but they only had 6 and 10 left. I can’t wait to wear these! Loosened Shelby Blouse! 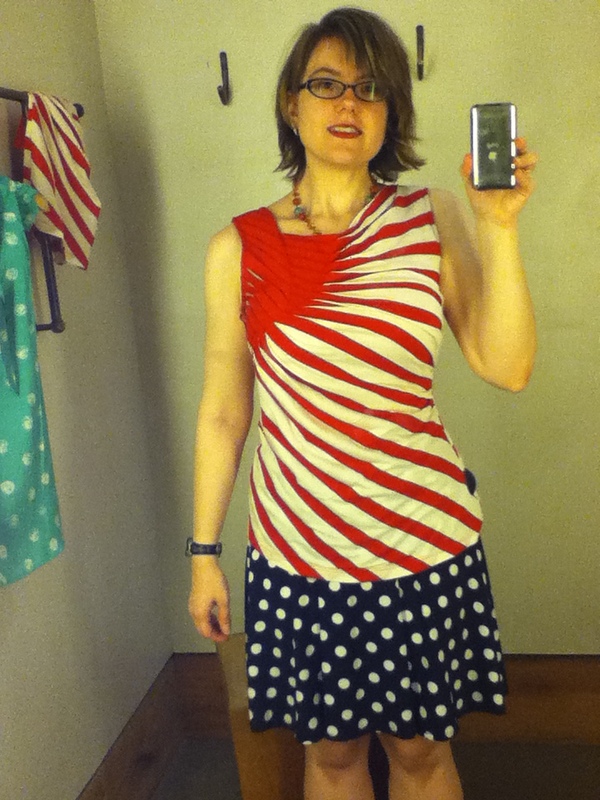 Also, you saw, an item I tried on in May. That size 8 had been too big, and this size 4 fit well. It’s clingy in the right places and swingy in the right places. It’s going to look great with skinny jeans. Lido Light Skirt. This is so cute and so comfortable and I love the colors so much. It just screams summer to me! A white cardigan that I desperately needed. I have heard that BP’s 3/4 sleeve juniors cardigan is a near dupe for my beloved JCrew Jackie, and I would agree with that. It’s also a third of the price, whoot! There have been several times where I knew a white cardi would be my best bet, so I’m glad to finally have it as an option. I can’t wait to get these things into my wardrobe rotation!